← Michelle Obama in India: Fashion Faux Pas? After touring the Taj Mahal and the Mani Bhavan Gandhi Museum yesterday, First Lady Michelle Obama made a quick fashion change before visiting a group of children at a local university near Mumbai. She danced, sang and even kicked off her shoes to play some hopscotch with these children who were enrolled in “Make A Difference,” a program to help underprivileged students learn English. Young adults in the community volunteer their time and serve as mentors to these children, helping them learn through readings, games and many more fun activities. For this fun event, Michelle changed into a casual, easygoing outfit. She paired a J. Crew Moss Olive Lace Tee (available here) with a tiered, floral skirt. She finished off her look by pinning another Erickson Beamon brooch to her blouse and adding a pair of leather ballet flats. This look is again another different look for Michelle. 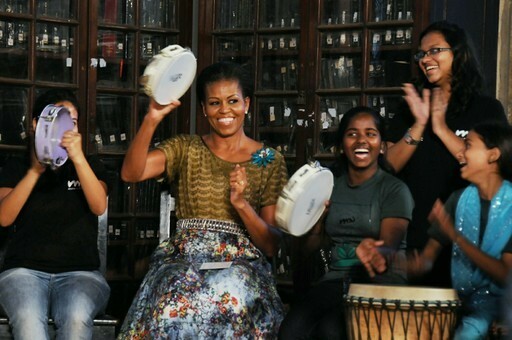 However, it seems as though this fun-loving, eclectic look fits Mrs. Obama. She is having fun and trying to fit in with the culture. Although she may not look ready to walk across the red carpet or even through the streets of the United States, she is attempting to fit in with the Indian style and doing a great job. What do you think about this look? Should she wear this style in America or keep it in India? This entry was posted in Michelle Obama, Obama Asia Tour. Bookmark the permalink. Subscribe to FashionablyCorrect.com and receive notifications of new posts by email.